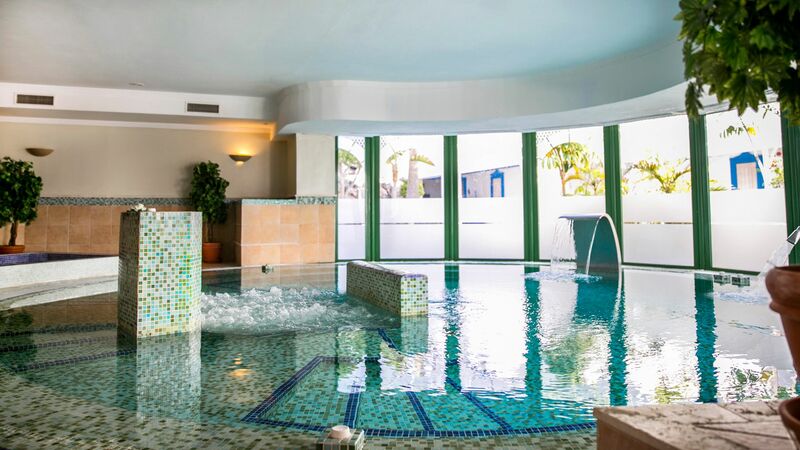 Located on the golden sandy beach in Lanzarote’s Playa Blanca, Hotel Volcan Lanzarote is a luxury 5-star hotel with everything you need for a relaxing and comfortable stay. Choose Club Volcan for the ultimate in luxury and enjoy its many amenities, including an exclusive breakfast, welcome cocktails, access to thermal circuits, and more. Each of the rooms contains chic, beachy interiors and views of the gardens or Atlantic Ocean. When it comes to dining there are four options, with beautiful interiors and a delicious menu full of Spanish and Canarian favourites as well as international options. During the day choose from the hotel’s five swimming pools and the golden sandy beach in front of the hotel. Hotel child prices apply to ages 2–12 years. The hotel has 251 rooms, 7 floors, and 5 lifts. Specially modified rooms for people with reduced mobility are available on request. Club Volcan is an adults only area offering exclusive services and amenities. The service includes late check outs, a welcome cocktail, private buffet breakfast, an exclusive swimming pool and lots more. Club Volcan is for guests aged 18 years and over. Choose from delicious international dishes, including Italian and Asian, in this elegant restaurant. Men are required to wear long trousers and closed shoes for dinner. Enjoy buffet breakfasts and dinners, including Spanish and Canarian cuisine. Themed buffets are served at dinner and breakfast includes show cooking. Men are required to wear long trousers and closed shoes for dinner. Guests on half board can dine at this restaurant. Enjoy a la carte regional dishes and Spanish tapas perfect for sharing in this laid back restaurant and bar. Delicious authentic Italian cuisine is served in this a la carte restaurant. Choose from pizzas, pastas, succulent meats and creamy cheeses. Half board guests staying at Hotel Volcan Lanzarote for a minimum of seven nights can choose one evening meal at this restaurant. A reservation is required. There are five swimming pools to choose from during your stay, each surrounded by exotic gardens and sun loungers. Relax, unwind and immerse yourself in the tranquillity of the resort at the hotel’s onsite spa. Choose from massages, facials, body wraps and more, as well as a sauna, whirlpool and Turkish bath. Forget dry beach hair and enjoy blow dries and treatments, as well as styling, at the hotel’s hair salon. 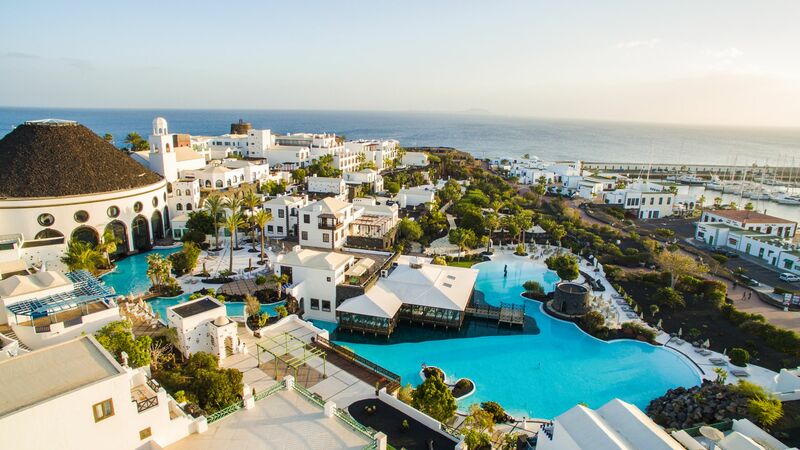 Found on the south coast of Lanzarote, Hotel Volcan Lanzarote is in the lively resort of Playa Blanca, ideally located for those wanting to enjoy a luxury holiday on the island. It benefits from sunshine throughout much of the year, with easy access to the beach and marina. History lovers are close to the resort’s castle, while the Museo Atlantico is also within reach. This underwater museum has some fascinating installations and exhibits. Playa Blanca is an idyllic beach retreat, with some fantastic bars and restaurants overlooking the sands. It’s perfect for seafood lovers and those wanting to try some delicious Spanish and Canarian varieties of wine. The marina area has a host of upmarket eateries, while those wanting to buy clothing and unique gifts should visit the boutiques and shopping centres. 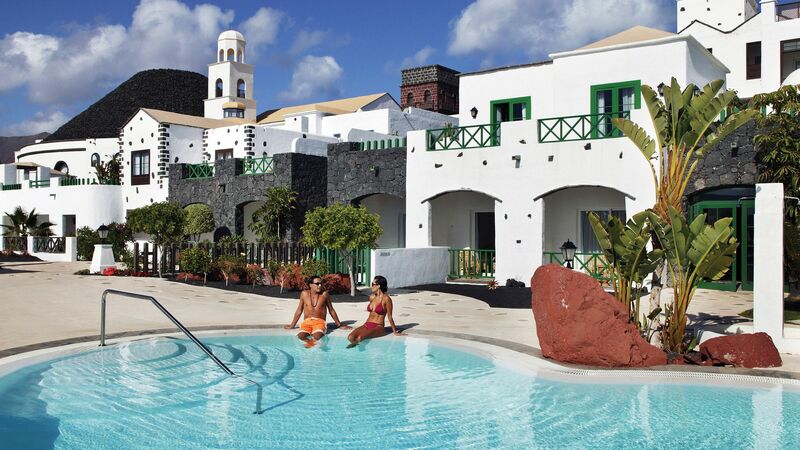 Hotel Volcan Lanzarote is a 30 minute drive from Lanzarote Airport. Double Garden View rooms have a king-size bed or twin beds, a seating area, air conditioning, satellite TV, telephone, minibar, bathrobes & slippers, tea & coffee making facilities, hairdryer, bathtub, shower and a balcony or terrace. Double Sea View rooms have a king-size bed or twin beds, a seating area, air conditioning, satellite TV, telephone, minibar, bathrobes & slippers, tea & coffee making facilities, hairdryer, bathtub, shower and a balcony or terrace. Junior Suites have a hydromassage bathtub and pool views. Suites are more spacious and have a separate lounge area and terrace. Double Room Club Volcan rooms are for adults only and are based in the Club Volcán area of the hotel. They offer a more exclusive experience, with majority of the rooms offering lovely sea views. Additional amenities and services include: early check-in and late check-out (subject to availability), welcome cocktail, bathrobes, slippers, sheet & pillow menu, tea & coffee making facilities, mini hifi in the room, mineral water in the room upon arrival, private breakfast buffet or you can take breakfast in your room at no extra charge (on request), courtesy bar from 18:00 - 21:00, tea and cakes from 16:00 - 18:00, access to an exclusive heated pool with pool bar service with complimentary aperitifs and fruit, complimentary WiFi in public areas, 10% discount in the hotel's restaurants (excluding drinks), courtesy beach bags, free use of the tennis court at the Marina Rubicón, daily newspapers in lounge area, Free access to the thermal circuit, sauna and Turkish bath, 10% discount on massages and a selection of treatments, exclusive pool with pool bar, Solarium and private terrace and access to two Jacuzzis® and Balinese beds on the pool terrace. Junior Suite Club Volcan rooms are for adults only and are based in the Club Volcán area of the hotel. They offer a more exclusive experience, with majority of the rooms offering lovely sea views. Additional amenities and services include: early check-in and late check-out (subject to availability), welcome cocktail, bathrobes, slippers, sheet & pillow menu, tea & coffee making facilities, mini hifi in the room, mineral water in the room upon arrival, private breakfast buffet or you can take breakfast in your room at no extra charge (on request), courtesy bar from 18:00 - 21:00, tea and cakes from 16:00 - 18:00, access to an exclusive heated pool with pool bar service with complimentary aperitifs and fruit, complimentary WiFi in public areas, 10% discount in the hotel's restaurants (excluding drinks), courtesy beach bags, free use of the tennis court at the Marina Rubicón, daily newspapers in lounge area, Free access to the thermal circuit, sauna and Turkish bath, 10% discount on massages and a selection of treatments, exclusive pool with pool bar, Solarium and private terrace and access to two Jacuzzis® and Balinese beds on the pool terrace. Suite Club Volcan rooms are for adults only and are based in the Club Volcán area of the hotel (some of the suites are located just outside of this area). They offer a more exclusive experience, with majority of the rooms offering lovely sea views. Additional amenities and services include: early check-in and late check-out (subject to availability), welcome cocktail, bathrobes, slippers, sheet & pillow menu, tea & coffee making facilities, mini hifi in the room, mineral water in the room upon arrival, private breakfast buffet or you can take breakfast in your room at no extra charge (on request), courtesy bar from 18:00 - 21:00, tea and cakes from 16:00 - 18:00, access to an exclusive heated pool with pool bar service with complimentary aperitifs and fruit, complimentary WiFi in public areas, 10% discount in the hotel's restaurants (excluding drinks), courtesy beach bags, free use of the tennis court at the Marina Rubicón, daily newspapers in lounge area, Free access to the thermal circuit, sauna and Turkish bath, 10% discount on massages and a selection of treatments, exclusive pool with pool bar, Solarium and private terrace and access to two Jacuzzis® and Balinese beds on the pool terrace. Save up to 20% on the hotel price for holidays between 01 - 30 April 2019 booked by 30 April 2019. Save up to 15% on the hotel price for holidays between 01 July - 31 August 2019 booked by 30 April 2019. Save up to 15% on the hotel price for holidays between 21 May - 25 August 2019 booked by 30 April 2019. Save up to 15% on the hotel price for holidays between 01 May - 14 June 2019 & 23 June - 31 August 2019 booked by 30 April 2019. Stay a minimum of 14 nights and receive 2 free buffet dinners per person per stay for holidays until 30 April 2019. Guests who upgrade to half board for a minimum of 7 nights can dine in the a la carte restaurant 'Rubicon' once per week/stay for holidays until 30 April 2019. Guests staying a minimum of 21 nights will receive 10% discount on the hotel price for holidays until 30 April 2019. Honeymooners staying for a minimum of 4 nights until 30 April 2019 will receive 5% discount on the accommodation price, welcome cocktail on arrival, breakfast in room the day after the arrival (upon prior request), bottle of cava and fruit basket in room on arrival, welcome gift, guaranteed late check-out, bathrobes and slippers, sheet & pillow menu, romantic dinner for two with a bottle of cava, one thermal spa circuit per stay and 20% discount on additional spa treatments. Couples must not have been married for more than 6 months and marriage certificate will be required on arrival. Special prices when one adult is travelling with children available at this hotel - please call our Travel Experts for details. This was our first visit to the Volcan but it will certainly not be our last. We had an amazing week. The hotel is so comfortable, beautifully decorated and perfectly situated for exploring. Far enough out of Playa Blanca centre to be peaceful but a short walk to the beaches. 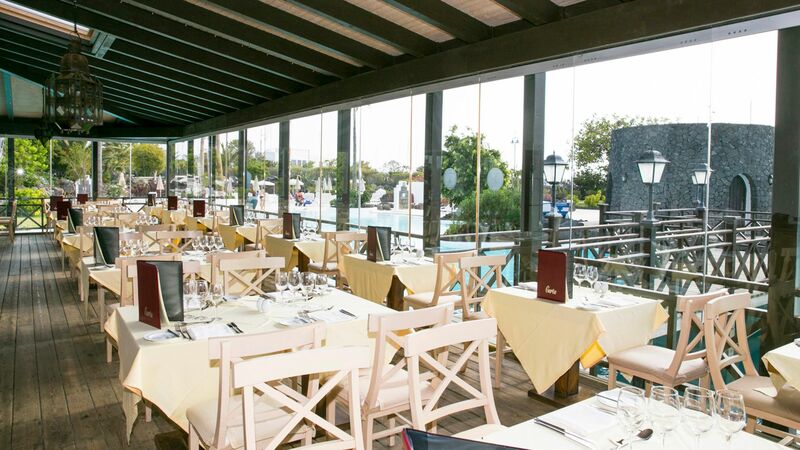 Marina Rubicon, a two minute walk, provides everything you need, including many fabulous restaurants and bars. The hotel staff are so helpful and do all they can to make your stay pleasurable. Thank you to all the staff, see you next year! From start to finish, our stay was ???perfect???. We were staying in the volcan club adults only section which gave us our own adults only section of a lovely pool with bar, two jacuzzis and plenty of relaxing sun loungers, free mini afternoon tea and unlimited complementary drinks from 6.30pm-10pm (alcoholic & soft drinks), which bar snacks. We also had breakfast in this section which made our holiday. We had dinner in the main restaurant of the hotel which was almost perfect, food was amazing but you had to pay for all drinks including water, one bottle of free water per table would have gone down much better. All staff were extremely attentive and the main hotel was incredible. We can?? ?t wait to return for a longer stay and hopefully stay in the volcan club section again, it was well worth the money and 5 star rating! Bike hire in the hotel was also great, excellent staff and great electric bikes. You could easily stay at this hotel and not leave all holiday, it has everything needed for all ages. We?? ?ve just returned home from a wonderful holiday at this lovely hotel after an 11 night stay there. It really is a great hotel, in a perfect location, situated on the edge of the marina outside Playa Blanca. Upon arrival we were met with a welcome drink and shown to our room, which was located opposite the children?? ?s pool. This was perfect for us with our four year old daughter, as we spent a lot of time in this pool and was handy for numerous toilet trips back and forth(!) The room was more than large enough for the three of us, very clean and well equipped. We especially liked the fact that there were always plenty of sunbeds available around all four of the swimming pools, no matter what time of the day. We were very impressed with the vast choice and quality of food on offer at breakfast (we didn?? ?t opt for the half board package, so can?? ?t comment on the evening food). The breads and cakes offered were excellent - some of the nicest I?? ?ve had at a hotel resort. The staff in here were very helpful, happy and worked hard to keep everything flowing, especially during busy periods. I think we had one day here where it was very busy, over a weekend, but there were always seats available and plates are cleared away quickly. But what most impressed us was the Entertainment Team, headed by the lovely Gaby with her team Bertina, Adele and Jamie, who look after both the Kids Club and the Events programme at the Volcan, We hadn?? ?t read any reviews about the kids club, so didn?? ?t really know what to expect, but we needn?? ?t have worried as it was excellent! It was open daily from 10-14.00 (perfect for getting the little ones out of the midday sun for a couple of hours) and caters for children between age 4-12 (under 4s need to be accompanied by a parent). Your child can go along for all or just part of that. Everyday they were doing different activities with lots of focus on arts and crafts, plus plenty of dressing up items and toys/games to play with. We took our four year old for a look and she loved it and asked to go back each day - some days for just an hour, and others for 3-4 hours. The staff who run it are lively, engaging, caring and energetic and all speak Spanish and English, plus between them French, German and Dutch. It really deserves a special mention, especially for those thinking of staying with children and are wondering what the hotel has to offer. There is also a kids disco at 19.30 but ours never made it to this as was either asleep (after all the activities) or we were at dinner. I know that a lot of children enjoyed this though! We ate our evening meal out every night at various restaurants in the Marina. The food was wide and varied, and on the whole very good. They all offer a fixed price children?? ?s menu for around ???5. The only one we wouldn?? ?t revisit was the large (TexMex) Steakhouse Grill restaurant on the corner of the Marina. They seem to have lost their way a bit re; the quality of food and service. We will definitely be returning to the Volcan in the future. Would highly recommend it to everyone especially those with young children. In our opinion not only is it a lovely hotel but has the best location in Playa Blanca! We stayed here on the recommendation of friends and were not in any way disappointed. It is located by the marina away from the main part of town, but has plenty of shops and eateries in the immediate vicinity. There is a promenade just outside the hotel grounds which gives walking access in both directions, towards town and further out. It's about 20-25 minutes to walk in to Playa Blanca centre. The hotel itself is very comfortable and clean, and all of the staff we met were friendly and efficient. Tea and coffee making facilities are in the room and replenished daily - very good. The breakfast offering is very wide-ranging and should satisfy every taste. Built over several levels into the (small) cliffs the hotel has a large footprint and during our week's stay I don't think we saw every part of it. There are at least three outdoor pools for example. We sampled the restaurant one night - it's a hot buffet with great choice and a theme which differs from night to night, although I think this affects only a small part of the offer. If you like it will probably depend on your opinion of the hot buffet as a dinner concept, buy I'd happily revisit it if we returned to the hotel, which we'd also very happily do. Although not crazy about Playa Blanca itself, Hotel The Volcan was faultless in a delightfully quirky way -10/10. Don't be put off by the monks on entry !